The ability of people to access various modes of transportation in our rural-urban mix region is fundamental to prosperity and wellbeing for all. Niagara’s attractiveness as a place to live, work, learn, play, visit, put down roots, raise a family and grow older is affected by availability and accessibility of transportation assets. The 2016 Canadian Index of Wellbeing (CIW) National Report tracked Indicators from 1994 to 2014, including time spent on work-related activities. During that period, the average daily commute time to and from work for Canadians with paid employment increased from 42.6 minutes to over 52 minutes. Thus, compared to 20 years ago, Canadians are spending almost 20 additional minutes per day (about 80 hours per year) commuting. Niagara Region’s first-ever Transportation Master Plan (TMP) was approved by Regional Council on July 20, 2017. The TMP presents a 25-year strategy to guide planning, development, renewal and maintenance of a multi-modal transportation system consistent with projected needs, and aligned with anticipated growth and vision for a sustainable Niagara. In 2017, Niagara Region, in collaboration with the City of Welland, City of Niagara Falls, and City of St. Catharines, achieved a triple majority vote to secure consolidated transit service. Now, the Region is developing a shared transit solution for Niagara which includes future transit infrastructure improvements, such as the implementation of daily GO train service. Across the region, there are 11 Active Transportation advisory groups in local municipalities. These groups include a balance of citizens, municipal staff, and elected officials. Through support of these groups, six municipalities have achieved bike-friendly community status and one has achieved walk-friendly community status. 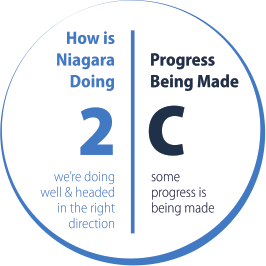 In 2015, the business case was completed for the Getting There model for centrally-dispatched access to health and human services for the most vulnerable people in Niagara. The case was collaboratively built by 30 Niagara agencies, and it is based on the Huron-Perth Easy Ride consortium model. The Niagara Police Services Board legalized Uber in Niagara as of July 01, 2016, and made it legal for taxis to operate anywhere in the region; previously, taxis could only operate in the local municipality where their licence was issued. The 2017 Niagara Region Transportation Master Plan (TMP) includes a focus on moving people and goods. The focus on people aligns with work already completed by the Age-Friendly Niagara Network, the Niagara Poverty Reduction Network, and the Niagara Region Active Transportation Subcommittee and Accessibility Advisory Committee. In response to growing demand and opportunities, the Niagara Cycling Tourism Centre and Venture Niagara are working with local business improvement areas in the region to strengthen support for infrastructure that encourages cycling, such as bicycle lanes, bicycle parking, and promotion of Niagara as a cycling tourism destination. Niagara Region is undertaking an amendment to the Regional Official Plan to support the goals, vision, and recommendations identified in the Niagara Region TMP. This amendment is necessary to ensure that the Region’s transportation policies conform to the policies and objectives identified within the Ontario government’s Places to Grow program. The TMP includes a Key Action Step to develop the Business Case for transfer of the Niagara Ride Share (NRS) program to Niagara Region. In 2015 NRS began connecting people living in the same area so they can share a ride to work, school or appointments. By 2017, the program had logged 628 total participants and 136 connections. NRS is coordinated by Bridges Community Health Centre, with funding support from the Niagara Prosperity Initiative. In 2016, the province confirmed GO Train service to three station locations: Grimsby (by 2021); St. Catharines (by 2023); and, Niagara Falls (by 2023), with a fourth potential future station location in the Town of Lincoln (Beamsville). In consultation with Metrolinx, Niagara Region has initiated a mobility hub study for one local hub in each of those four areas, to focus on full connectivity with expanded GO rail service. Elementary schools in Niagara are putting the national School Travel Planning program into action, by getting whole communities working together so students who live near their school can walk or bike there. Pay attention to how data is collected, shared, used, and leveraged to inform next steps for Transportation Demand and System Management elements of the 2017 Niagara Region Transportation Master Plan (TMP). Ensure implementation of actions identified in the 2017 Niagara Region Transportation Master Plan (TMP). Consider creating a Transportation Demand Management/ System Management position to coordinate ongoing implementation of the TMP. Further develop consolidated transit service in the Niagara region, including future transit infrastructure improvements that align with implementation of daily GO train service. Continue to address road safety behaviors with a focus on reducing distracted and impaired driving. Follow through on the 2017 TMP focus on Transportation Choice by ensuring investments around choice align with what’s accessible for people in Niagara. Build on work already done to systematically increase access to health and human services for vulnerable people in Niagara, by continuing to invest in advancing the Ride Share and Getting There models.